NOTE: You are purchasing a standalone product; MasteringA&P does not come packaged with this content. If you would like to purchase both the physical text and MasteringA&P search for ISBN-10: 0321980875 /ISBN-13: 9780321980878 . That package includes ISBN-10: 0321971353/ISBN-13: 9780321971357 and ISBN-10: 0133999300 /ISBN-13: 9780133999303. Dr. Marieb has partnered with Benjamin Cummings for over 30 years. Her first work was Human Anatomy & Physiology Laboratory Manual (Cat Version), which came out in 1981. 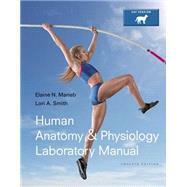 In the years since, several other lab manual versions and study guides, as well as the softcover Essentials of Human Anatomy & Physiology textbook, have hit the campus bookstores. This textbook, now in its Ninth edition, made its appearance in 1989 and is the latest expression of her commitment to the needs of students studying human anatomy and physiology. Dr. Marieb has given generously to provide opportunities for students to further their education. She contributes to the New Directions, New Careers Program at Holyoke Community College by funding a staffed drop-in center and by providing several full-tuition scholarships each year for women who are returning to college after a hiatus or attending college for the first time and who would be unable to continue their studies without financial support. She funds the E. N. Marieb Science Research Awards at Mount Holyoke College, which promotes research by undergraduate science majors, and has underwritten renovation and updating of one of the biology labs in Clapp Laboratory at that college. Dr. Marieb also contributes to the University of Massachusetts at Amherst where she generously provided funding for reconstruction and instrumentation of a cutting-edge cytology research laboratory. Recognizing the severe national shortage of nursing faculty, she underwrites the Nursing Scholars of the Future Grant Program at the university. In January 2012, Florida Gulf Coast University named a new health professions facility “Dr. Elaine Nicpon Marieb Hall.” With the help of Dr. Marieb’s generous donation, this facility contains laboratories in the School of Nursing that simulate an operating room, intensive-care unit, a labor and delivery room, and general medical surgical suites. She has also established a scholarship endowment for non-traditional students in the health professions, and an endowment to enhance the activities of faculty, students, and staff within health professions to support education, research, and community outreach.